The Republicans have been in the minority for just over one month, but already have their roadmap of seats they’d like to flip to return to the party in power in 2020. Today, the National Republican Campaign Committee released a list of 55 House Democratic seats to Roll Call, that they are hoping to take back in the next election. 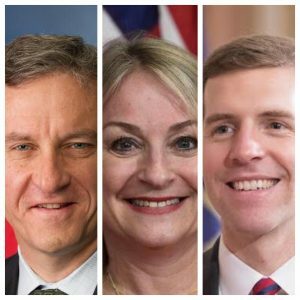 Reps. Matt Cartwright (D-Lackawanna), Conor Lamb (D-Allegheny), and Susan Wild (D-Lehigh) were the three Pennsylvania representatives included in their initial 2020 list. All three won their races around the 10 point margin in November. Cartwright, the only one defending his seat in 2018 of the three, represents a district President Donald Trump won in 2016, had the closest re-election bid of the three, but still won by a comfortable margin. Cartwright secured a fourth term in Congress by defeating Republican John Chrin by just over 9 points. Trump carried these boundaries by close to 10 points in 2016, while Cartwright fended off Republican Matt Connolly by a 7.6 point margin. Lamb and Wild were both elected to their first full terms in Congress this past November by double digit victories. Wild defeated Republican Marty Nothstein by 10 points for the open seat in the Lehigh Valley. She also defeated Nothstein by a razor thin margin in the special election to represent the old 15th District, which was vacated by Rep. Charlie Dent (R-Lehigh), giving her a head start in Congress over many of her incoming freshman colleagues. Sec. Hillary Clinton narrowly bested Trump in these boundaries in 2016. In the only race in the nation where two incumbents were pitted against each other, Lamb took down Rep. Keith Rothfus (R-Allegheny) by just over 12.5 points. Lamb captured the national spotlight when he upset Republican state Rep. Rick Saccone in the old Trump friendly 18th district, vacated by Rep. Tim Murphy (R-Allegheny), in a special election earlier in 2018. The 17th district that Lamb represents now went to Trump in 2016 by just a couple of points. Pennsylvania’s Congressional delegation at the beginning of this session was locked even at 9 Democrats and Republicans each, but Rep. Tom Marino (R-Lycoming) resigned in the middle of last month, leaving one seat open until the May 21 special election date. The 12th Congressional District that Marino represented is a GOP stronghold that voted for President Trump by over 35 points. This is just a DC stunt to raise money. These seats are all safe as a result of Trump’s unfavorability and the judicialmandered districts. Will the GOP get John Chrin to spend more of his own $$ on trying to win the Wild seat in the Lehigh Valley rather than in NEPA? Better yet, let him run where he really lives in NJ. Sam: don’t worry because Long and Nyquist will gladly waste more of this guys money while telling he can win only to go on and lose by 10 points. That is their M.O. Yeah, L & N saw that guy coming! They got him to flush $1.7M of his own money and a year of his life down the drain just so they could soak him. They got him to outspend Cartwright by 1/2M and he still got thumped. He really should sue them for fraud. Embarrassing that Marty even lost the old 15th. It should have been an easy R win. WORST. CONGRESSIONAL. CANDIDATE. They can target whomever they want, but in 2020, Trump is going to be swept out of office and Republicans are going to have a hard time picking up any seats. There will be a few surprises in some lean GOP districts that Dems won in 18, but Cartwright, Lamb and Wild aren’t going to lose in 2020. In fact, the tide won’t turn against the Dems until they seize total power of the White House and both houses of Congress, and then only if they mess it up. The 40 year old trickle down scam of Republicans is finally being exposed and 70% want financial retribution on the billionaires. Yes, the trickle down scam is being exposed. In reality the middle class works for poor people. Poor people, not rich people, pay their employees. Obviously, I am being sarcastic. Spoken like a man who has never had to work hard a day in his life.